AAR's annual Wine & Beer Tasting event will be held on Sunday, March 24th from 4pm-7pm at Balmorhea Events in Magnolia. 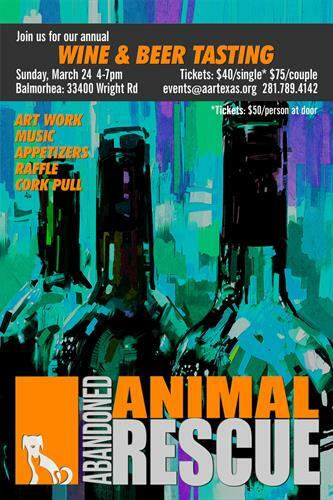 Event includes wine/beer, appetizers, music, cork pull, raffle, and artwork from local artists. Get your tickets online at aartexas.org. Balmorhea Events: 33400 Wright Rd, Magnolia, TX 77355.